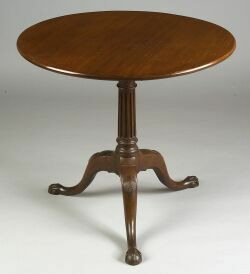 Chippendale Mahogany Carved Tilt-top Tea Table, Massachusetts, 1765-80, the circular top turns on a pillared birdcage platform on a turned and fluted support and tripod cabriole leg base, the knees carved with pectin shells continuing to claw and ball feet, old mellow patina, (very minor restoration), ht. 28, dia. 30 in. 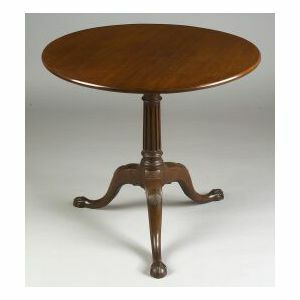 Provenance: Mary R. Atwood Antiques, Watertown, Connecticut. Literature: American Furniture, Queen Anne and Chippendale Periods, by Joseph Downs, plate 385, shows what appears to be a nearly identical table.